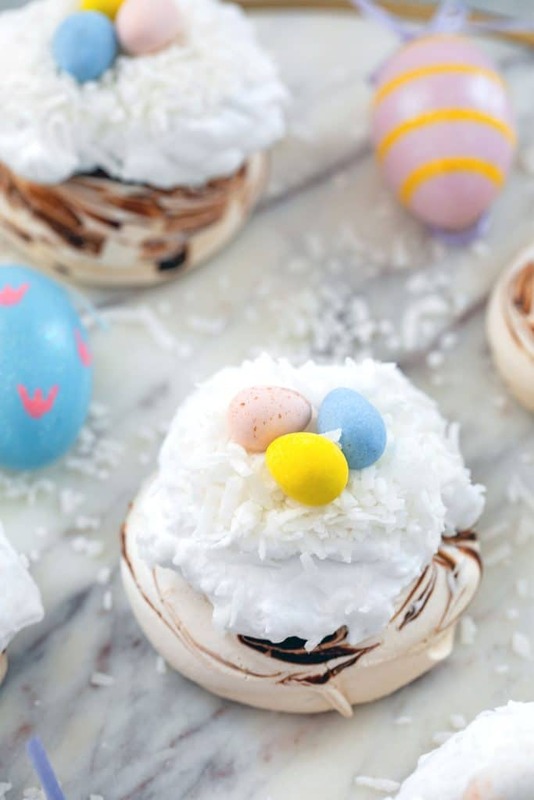 These Mini Easter Pavlovas have a chocolate swirled pavlova base and are topped with coconut whipped cream, shredded coconut, and Cadbury Mini Eggs. They make for a fun and delicious Easter dessert, but the mini pavlova base can be made any time of year! Were you up late watching Game of Thrones last night? I… was not. I legit think I’m the only person in the country who doesn’t watch, but I feel like it’s too late for me to start now. I know, I know, I could totally binge watch it, but I’m honestly just not a good TV binge watcher (I googled it and it would take me 65 hours to watch GoT. 65 hours!!). Especially for shows that you really have to pay attention to. The only way I can binge watch anything is if I can half watch the show and half edit photos or read blogs or do recipe research. 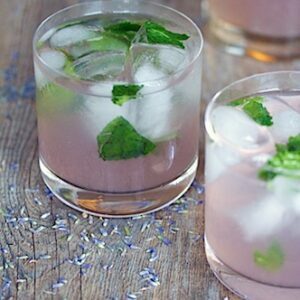 What I really need to do is put a television in my kitchen so I can cook, bake, and cocktail and watch at the same time. Maybe I would actually really enjoy Game of Thrones if I was watching it while making pavlovas? Also, I wonder how many mini pavlovas I could make in 65 hours? 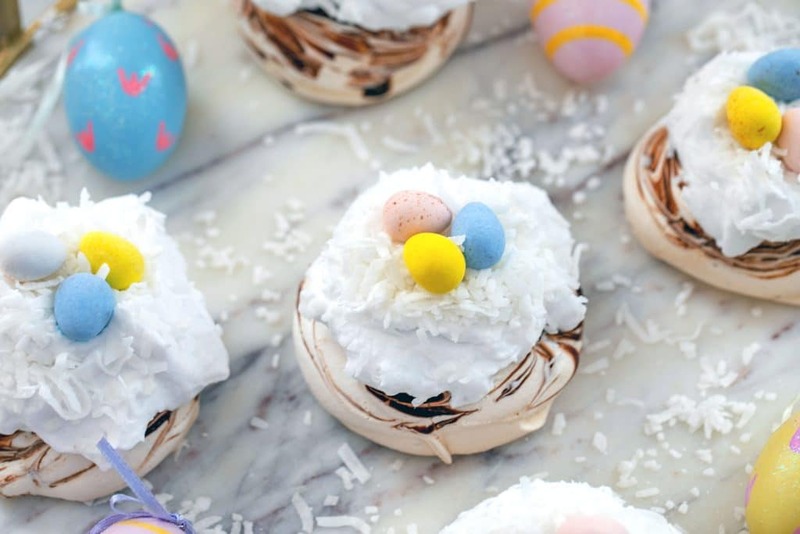 I’m calling these little desserts mini Easter pavlovas, but you can certainly make them any time of year without the Cadbury Mini Eggs. Or I mean, you could always save a bag of mini eggs and make these in the middle of October. 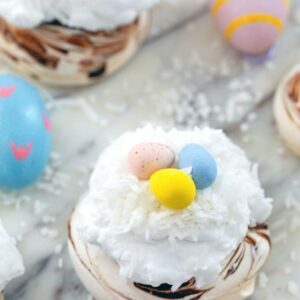 The actual pavlovas are a simple chocolate swirl pavlova and they’re topped with coconut cream whipped cream, shredded coconut, and Cadbury Mini Eggs. What’s the Difference Between Meringue and Pavlova? Great question! It’s actually funny because I brought these to my parents’ house and when my mom took a bite, she said, “they’re a little marshmallow-y in the center.” Yes! And that, my friends is the difference between meringue and pavlova. 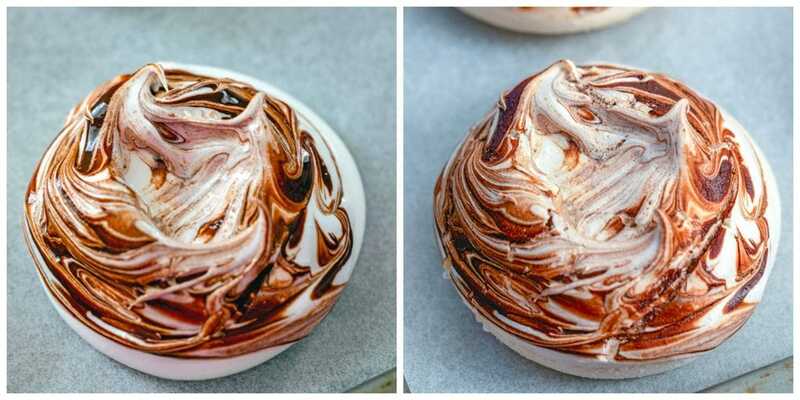 Pavlovas are a type of meringue, but while typical meringues are crispy throughout, pavlovas are crispy on the outside, but more gooey on the inside. Pavlovas generally have cornstarch in them (regular meringues don’t) and they’re cooked for a shorter time than meringue. Both are delicious, but I think of meringue as more of a fun little treat and pavlova as more of a served dessert. The most important part of making pavlova is making sure your egg whites are at the right consistency. You’ll start by beating the egg whites and salt in a mixing bowl at medium speed until soft peaks form. It will probably take about 2 minutes and you can see what soft peaks look like in the upper right photo of the below collage. Once stiff peaks have formed, mix in cornstarch, white wine vinegar, and vanilla. Now you’re ready to form your mini pavlovas. You could technically just scoop the batter onto a baking sheet, but I like to pipe it on since it’s a little bit nicer looking. I use a Wilton 1A tip, but you could also use a star tip like a 1M. Pipe batter onto parchment-lined baking sheets. I made rounds that were about 3 inches in diameter, but you can make any size you want. Leave at least an inch between each round, but don’t worry too much because the pavlovas shouldn’t really spread. Using a toothpick, swirl a little melted chocolate into the pavlova and then press gently with the back of a spoon to indent a bit. Pop in the oven at 240 degrees for 60 minutes. When an hour is up, turn the oven off and crack open the oven door. Let the pavlovas sit in the oven for another hour. This will help the pavlovas dry out more and prevent cracking. Below you can see how they look just piped onto the baking sheet and right out of the oven. 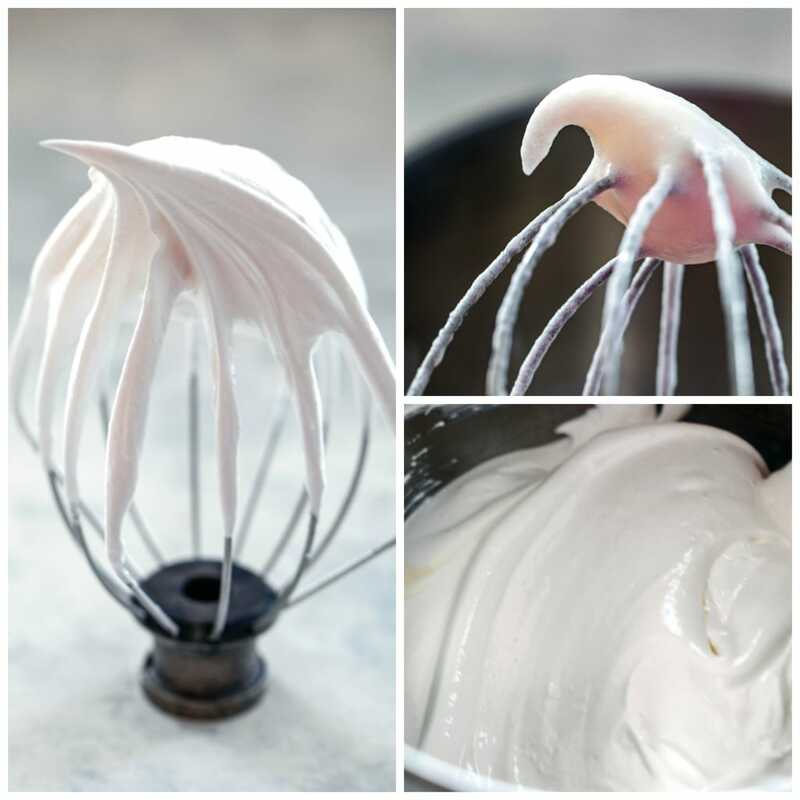 When pavlovas are finished baking, you can make the coconut whipped cream. Take a can of chilled coconut cream (you can also use coconut milk) and spoon out all of the cream, leaving any watery liquid behind in the can. 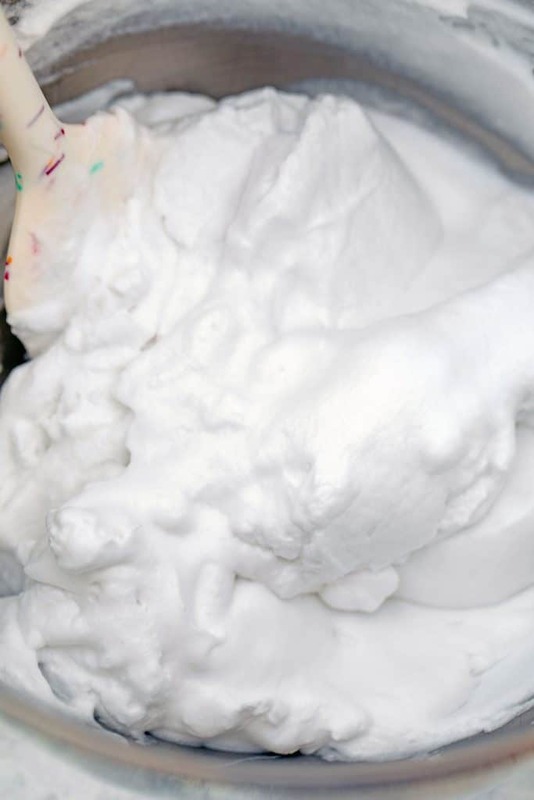 In the bowl of a stand mixer or in a large bowl with a hand mixer, whip the cream until it’s nice and fluffy. Add confectioners’ sugar and beat another minute. When pavlovas are completely cooled, top them with the coconut whipped cream, a little bit of shredded coconut, and Cadbury Mini Eggs. They’re like little bird’s nests! This Easter dessert is definitely for coconut lovers, but you can make a couple quick changes to it if you’re not a coconut fan. Instead of using coconut whipped cream, make whipped cream with regular heavy cream (or you can even buy it!) and omit the shredded coconut. These will still be seriously delicious. Because this dessert is really all about those chocolate swirled mini pavlovas. 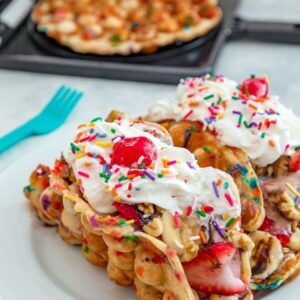 To be honest, they don’t need to be topped with anything at all and are fun to eat simply as a treat… But the whipped cream, coconut, and candy certainly make them more of a fun Easter dessert. Plus, there’s no chance I’d turn down the opportunity to eat more Easter candy. And I like that each mini pavlova has exactly three Cadbury Mini Eggs on it… Please keep the bag away from me, otherwise, I will not be able to stop eating them. I think I might vote them as most addictive candy EVER. Instead, now I can’t stop eating these chocolate swirled mini Easter pavlovas. I highly recommend making the pavlovas and coconut whipped cream ahead of time and then assembling them right before serving. The coconut whipped cream really needs to be refrigerated, but the pavlova will soften if you put it in the fridge, so I try to avoid that. 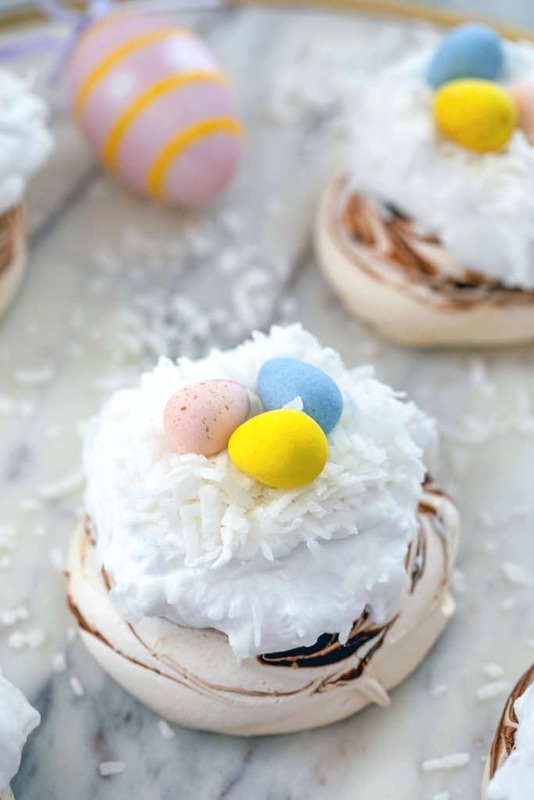 I absolutely love that these mini Easter pavlovas are nice and crispy on the outside and marshmallow-like on the inside and don’t want to do anything to lose that consistency! So, yes, I’m calling these Easter pavlovas, but I highly recommend you make the mini pavlovas any time and then top them with whipped cream and the candy of your choice. And now I’m ready to get in the kitchen and start binge making pavlovas! What are you serving for Easter dessert? If you want to binge make pavlova, too, check out my S’mores Pavlova or my Peppermint Pavlova with White Chocolate Whipped Cream. I also love this Blood Orange Pavlova from Kitchen Cartographer! Pre-heat oven to 240 degrees and line a baking sheet with parchment paper. In a stand mixer or in a large bowl with hand mixer, beat the egg whites and salt on medium speed until soft peaks form, about 2 minutes. With mixer still on, beat in sugar slowly, 1-2 Tbsp at a time, and continue to beat until egg whites turn shiny and stiff, about 6-8 minutes. 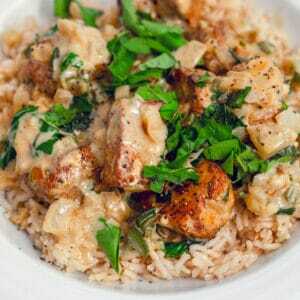 With mixer on low, beat in cornstarch, vanilla, and white wine vinegar. Scoop pavlova batter into a pastry bag fitted with a 2A or 1M tip and pipe rounds roughly 3 inches in diameter onto baking sheets about 1 inch apart. You should get about 12 mini pavlovas. Using a toothpick drizzle a little bit of dark chocolate onto each pavlova and gently swirl around. Using the back of a spoon, lightly press into each pavlova to make a slight indentation. Put baking sheets in oven for 60 minutes. Turn oven off, open slightly, and keep pavlovas in oven for another 60 minutes. Top each mini pavlova with coconut whipped cream. Sprinkle shredded coconut on and top each with 3 Cadbury Mini Eggs. I recommend making mini pavlovas and coconut whipped cream in advance and assembling them right before serving. Keep whipped cream in fridge and keep pavlovas in airtight container on counter. If you don't like coconut, you can top these with regular whipped cream and omit the shredded coconut topping. 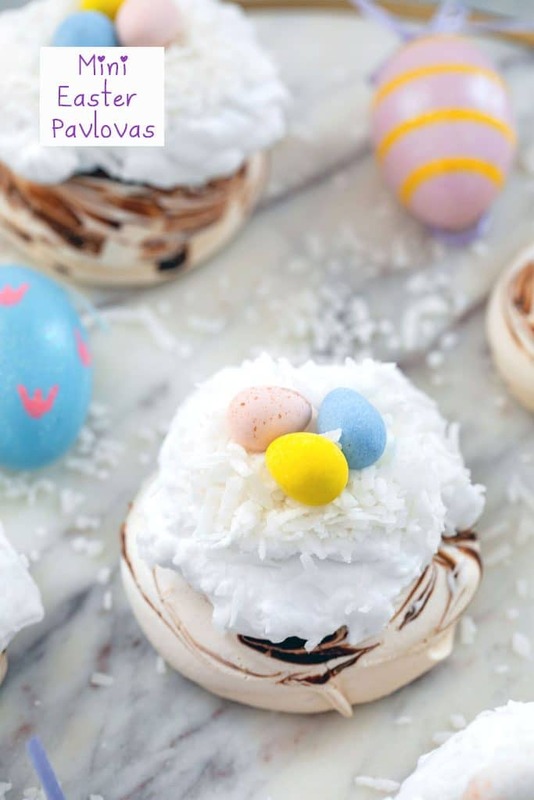 6 Responses to "Mini Easter Pavlovas"
These are so cute for Easter and I love Pavlovas! Can’t wait to test your recipe out. SO DARLING! We’re having Easter brunch with friends, and my bestie loves to cook too. She mentioned making pavlovas, and I am sending her this recipe pronto! 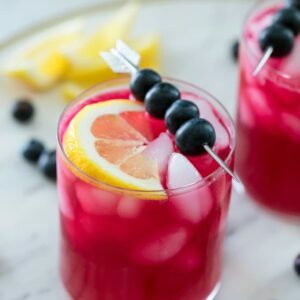 🙂 I can’t wait to try it! I totally prefer pavlova over meringue, but didn’t know the difference until now! These look great. And GoT. My husband fell in love with it while I was traveling two years ago. He insisted I watch all 7 seasons last year (at a leisurely pace), so we were ready for last night. Honestly, the first few seasons were hard for me to get into, but now I’m invested and enjoy the show! It’s one of the very few I”m actually caught up on though! Super cute! What fun – ideal for Easter, and delicious too 🙂 Adore this.